We are now taking orders for custom, handmade quilts by Phoenix! Contact us for info. Custom beaded lampshades,ornaments & ornament covers,pet portraits,beaded guitar straps,jewelry,wire baskets/boxes and many more beaded treasures, ALL ONE-OF-A-KIND! The Diva is now offering stained glass-work! We now have stained glass fan lamps, nightlights, jewelry and more! Watch for photos of some of our gorgeous pieces. All items made to order. If you have an idea for a lamp or shade just e-mail us and we'd be happy to design & create it for you! BEAD PORTRAITS ARE HERE! 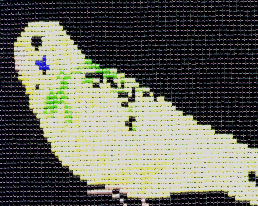 HAVE YOUR FAVORITE PET PHOTO MADE INTO A BEAUTIFUL BEAD PORTRAIT! Please allow 4-6 weeks, as all pieces are made to order. We are now offering BEADED BASKETS, BEAD-WOVEN GUITAR STRAPS,crocheted ornaments & linens,needlepoint, cross-stitched pet portraits, monograms and painted glass pieces. Any item you would like stitched we can probably do! Diva offers a wide variety of beaded items, including amulet pouches, earrings, necklaces, bracelets, belts, baskets and other specialty items. We make strung, woven and loom-woven items in Native American,African, Egyptian,Asian,Victorian,Celtic,Indian & other styles. We also offer beautiful macrame items made with the finest waxed linens. All of our creations are painstakingly hand-crafted using the best imported beads and stones, both precious and semi-precious, and only the finest handmade Sterling silver beads and findings, imported by us directly from Bali, Indonesia. In the near future we will be offering beaded clothing, lampworked beads, hats and other accessories, novelty items and more! Most items on this site can be custom made for you in any color or material you request. Offering a wide range of items at great prices, Lady Orchid hopes you enjoy your visit to our site. This venture started when Lady Orchid, a professional singer/musician, started beading to occupy her off hours. As she started wearing her creations onstage, she found that people wanted to know "where she got that". She started selling her pieces to fans and local shops and soon found that there was a big demand for quality hand-made jewelry. And the rest is history. 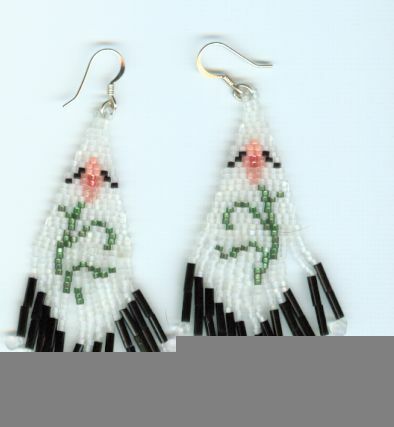 These earrings are hand-woven using only Miyuki Delicas from Japan (the finest quality seed bead) as well as Miyuki bugle and fringe beads and are finished with Sterling Silver findings. These dainty dangles measure aproximately 2" long. Available in any color combination- Call or e-mail! Egyptian Collar. This collar is made in Brick Stitch using Japanese seed beads. It is available in any color combination and with petroglyphs (as shown), Block letters (such as a name), chinese characters or other lettering. This pretty piece is strung with 8mm Rose Quartz rounds and my Sterling Silver spacers, imported from Bali, Indonesia. 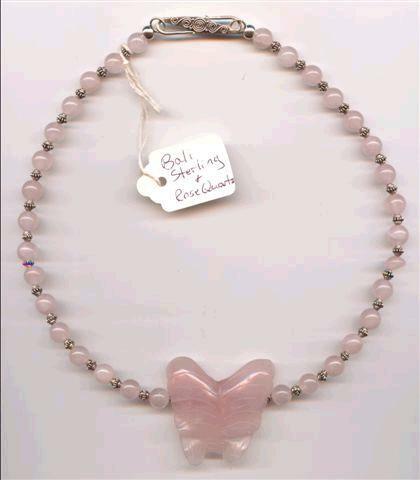 It features a lovely Rose Quartz butterfly as a centerpiece and is finished with a sterling Bali clasp. Available in choker to 18" length. This necklace has substance, while remaining feminine. Lovely! Call for matching bracelet or earrings. Please go to the "contact us" link and let us know how you like our site. You can also offer suggestions on what items you would like to see offered. I'm a trusted ReliableMerchants member -- click and find out why!